Michigan-based Katech Engines recently built the LT5 V8 from a new Corvette ZR1 from the ground up, ditching the supercharger for a custom twin turbocharged setup and on an engine dynamometer, Chevrolet’s most powerful road-going engine ever made a whopping 1,308 horsepower. Katech Engines is one of the top shops when it comes to building modern General Motors powerplants, with their most famous customers being the C5.R Corvette race cars that dominated the world of endurance racing. Katech also provides performance upgrades for road-going Corvettes and Camaros, offering race-ready components that yield gobs more Chevrolet horsepower. Recently, Katech built an LT5 V8 from a 2019 Corvette ZR1 from the block-up, adding a custom twin turbo setup and their in-house fuel system to lift the output from 755 horsepower to 1,308 horsepower on the engine dyno. The video below begins with footage of the Katech team building the LT5 starting with new rods and pistons and a set of worked cylinder heads. Once the valve train is in place, the engine is wheeled off to the dyno room for the rest of the build. It should be noted that this build includes the stock camshaft. In the dyno room, the Katech team assembled the twin turbo setup starting with the custom manifolds followed by the huge turbochargers, the custom exhaust system and the elaborate charge-air piping system that incorporates a pair of water-to-air intercoolers that are on the floor below the engine. There is also a custom intake manifold that replaces the supercharger housing, which has an integrated manifold design, and the build finishes up with Katech’s standalone fuel system providing the E85. After the LT5 build is completed, it is time to get the big numbers. The video shows two dyno pulls and the runs are made under compliance with SAE J607 standards. On the first pull, the numbers are pretty solid, with the boosted V8 hitting 1,206.6 horsepower and 1,130.2 lb-ft of torque, but the second run is even better. 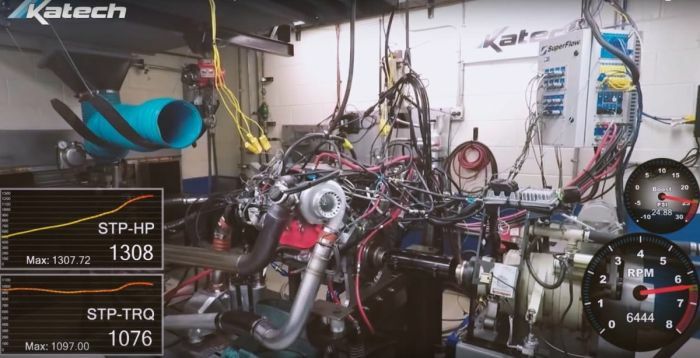 Unfortunately, due to the torque-measuring limits of this particular dyno, boost was regulated through the peak torque points, but the team was able to push harder on the top end, leading to bigger horsepower numbers. To be exact, the twin turbo LT5 made 1,308.5 horsepower while making “only” 1,097 lb-ft of torque on limited boost, both of which are big jumps over the stock figures of 755 horsepower and 715 lb-ft of torque. More importantly, Katech believes that this is the highest recorded power number for the modern LT5 on E85 and I am inclined to believe their claim. Hopefully they put this engine in a Corvette and make a video of that. Again, the video below begins with roughly six minutes of footage showing the engine going together, so if you want to just see and hear the dyno runs, jump to just past the six-minute mark.